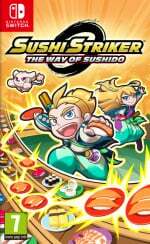 Yesterday's Nintendo Direct finally revealed the release date for Sushi Striker: The Way of Sushido, which was originally shown off at last year's E3 with the trailer above, and also announced that the game will be releasing on Nintendo Switch on the same day. Hitting the console of your choice on 8th June, this game sees players hurtling bits of sushi at each other from the conveyor belts in front of you, tasking you with piling up plates of matching colours to be successful. 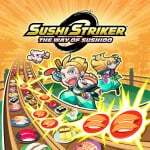 Raised in a world where sushi is forbidden (shock horror), the game's protagonist Musashi must wage all out conveyor belt sushi battles to defeat the empire and topple the sushi monopoly. The game will also support online multiplayer matches, although Nintendo has confirmed that there will be no cross-play available between the 3DS and Switch versions. Are you excited for this one? And just how amazing is that theme song? Wow. This game is so weird, I love it. Keen to give it a go. The Switch version, that is. I was waiting for a story on this game. I don't think I heard anyone talk about this after the Direct. Even this site took the next day to mention it, whereas every other Switch game got an article last night. It reeks of Japan and I'm not sure it'll do well in the West. I definitely have no interest in it. I was willing to skip it on 3DS but they've convinced me with a Switch version. Hopefully it's a decent price! Forbidden sushi is the best sushi! @ottospooky I never said that. Looks like a very unique, fun and intriguing game. May get this if it gets good reviews and the price is right. I'm genuinely interested in getting this game. I've seen a lot of people be pretty meh on this title but the gameplay looks fun and that theme song is banging! Love it!! Been waiting for news on this! So pleased they are keeping the 3DS version, which it was designed for. Been excited for this game since the announcement. Was interested in it when it was coming out on the 3ds, even more interested in it now that is coming for the Switch. Hope it has local multiplayer as well with a single Switch. I'm definitely down for this. Love weird games. That theme song really is good.
' Raised in a world where sushi is forbidden (shock horror)' - I haven't even played this game yet and I love it. It looks simple but brimming with charm; both in design and in gameplay. I'm certainly eager to try this out! Now the real question is whether I should get it on the 3DS or the Switch? It all comes down to the control method; no way in heck am I going to be using the touch screen of the Switch unless they introduce a stylus for it.